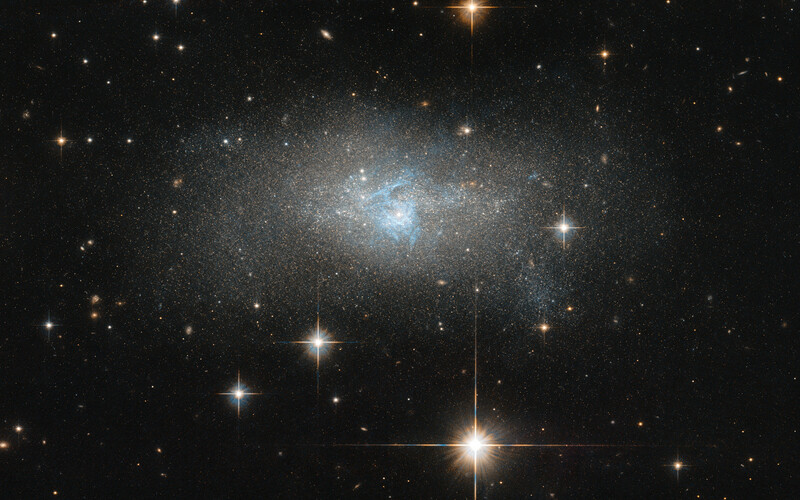 A ripple of bright blue threads through this galaxy like a misshapen lake system. The foreground of this image is littered with nearby stars with their gleaming diffraction spikes. A keen eye can also spot a few other galaxies that, while masquerading as stars at first glance, reveal their true nature on closer inspection. 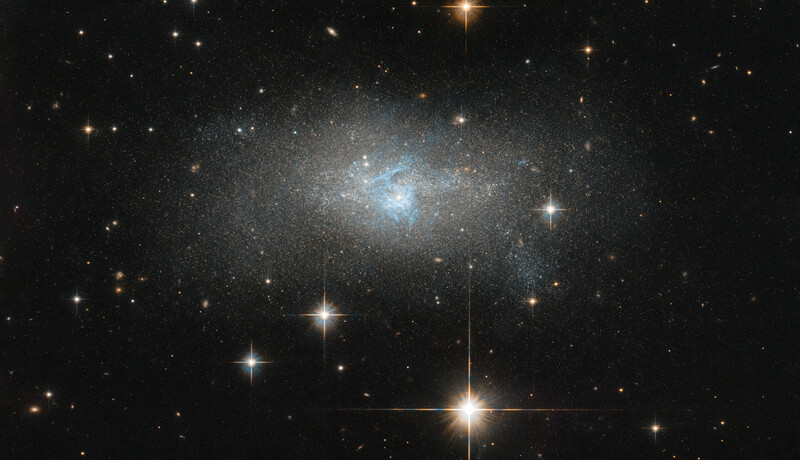 The central galaxy streaked with colour, IC 4870, was discovered by DeLisle Stewart in 1900 and is located approximately 28 million light-years away. It contains an active galactic nucleus, or AGN: an extremely luminous central region so alight with radiation that it can outshine the rest of the galaxy put together. AGNs emit radiation across the complete electromagnetic spectrum, from radio waves to gamma-rays, produced by the action of a central supermassive black hole that is devouring material getting too close to it. IC 4870 is also a Seyfert galaxy, a particular kind of AGN with characteristic emission lines. IC 4870 has been imaged by Hubble for several studies of nearby active galaxies. By using Hubble to explore the small-scale structures of AGN in nearby galaxies, astronomers can observe the traces of collisions and mergers, central galactic bars, nuclear starbursts, jets or outflows, and other interactions between a galactic nucleus and its surrounding environment. Images such as this can help astronomers understand more about the true nature of the galaxies we see throughout the cosmos. Position (Dec): -65° 48' 47.62"